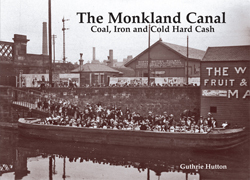 Canal and heavy industry expert Guthrie Hutton revisits Lanarkshire’s Monkland Canal which brought coal to Glasgow and kick-started the Coatbridge iron industry and, as the title suggests, made everybody involved plenty of money. Naturally the book contains lots of images of formerly grimier parts of Glasgow’s East End and of the Monklands area of Glasgow but there are also sylvan scenes like at Easterhouse which in the past was rural and post-war was built-up. Today much of the canal route is underneath the M8 Motorway and hence no longer open to navigation, at least not in the traditional meaning of the word!